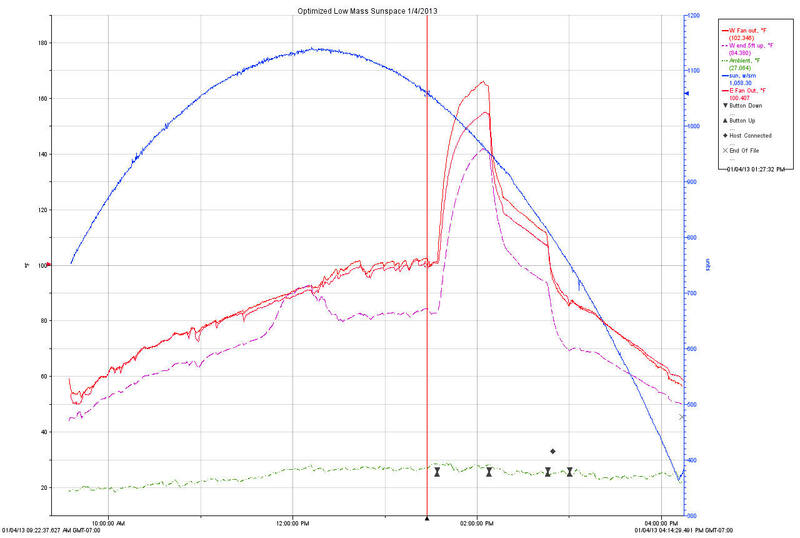 I've been working for the past couple months on a new section on Low Thermal Mass Sunspaces. In the course of doing the testing and putting this material together, I've become a real believer in this kind of sunspace design -- it offers an exceptional combination of space heating performance and multiple use living space that is hard to beat. I think that if more people came to appreciate how well these low thermal mass sunspaces perform, they would be far more popular. Space to lounge in the sun (even when it 10F outside). Space to read the paper and have a cup of coffee in the sun. Space for the kids to play. Four season space to dry clothes -- a major energy and carbon saving in itself. Space to dry and store firewood, or have a workshop, or may other uses. In addition, sunspaces can be very visually appealing and are more likely to pass muster with your HOA or your spouse than are active solar collectors. I believe that they are also likely to increase the value of your house more than other energy saving investments due to their aesthetic appeal and mulit-purpose nature. These sunspaces are efficient space heaters because their design is optimized to generate a lot of heat and to get that heat to the house. 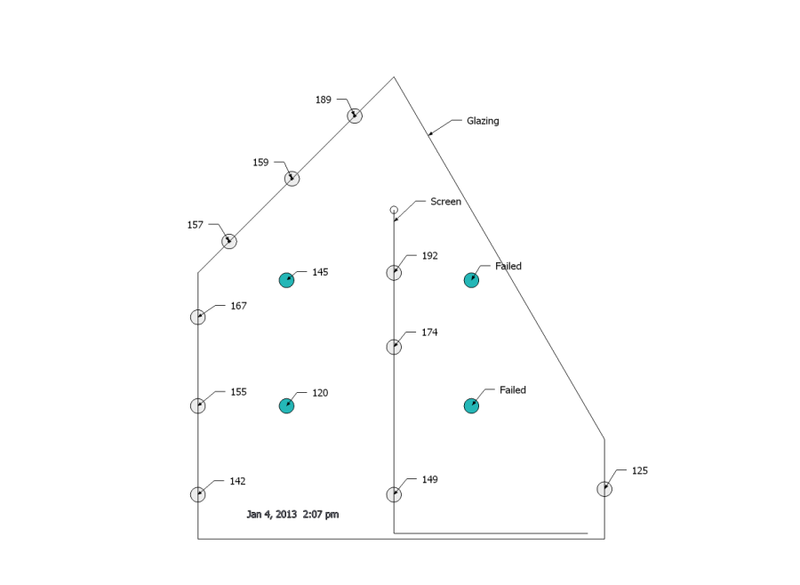 They intentionally have very little thermal mass -- this makes them heat up very quickly, and the heat they generate is transferred to the house rather than being used to heat thermal mass in the sunspace. I don't know of any other solar investment that is so cost effective as an energy and carbon saver, and at the same time provides so many other family benefits. 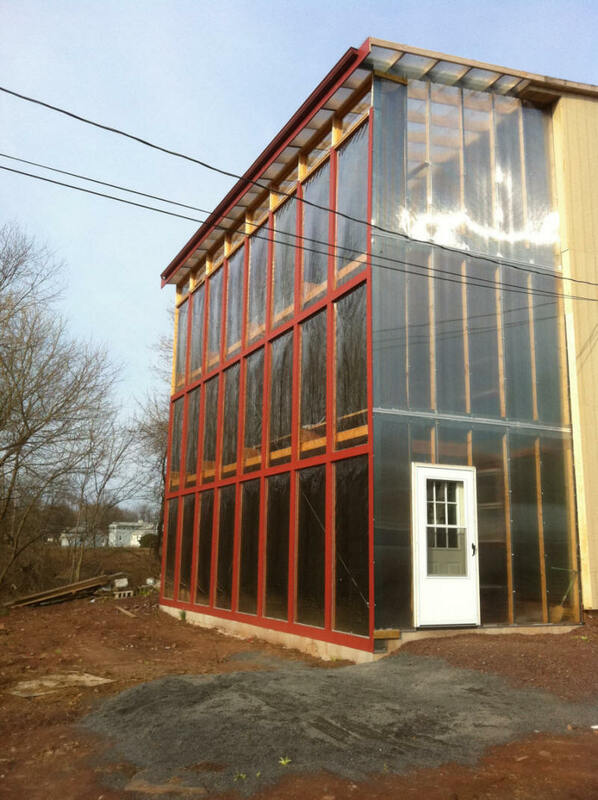 - A design guide that explains what the low thermal mass sunspace is, how it works, and why its efficient. The guide also covers a number of design guidelines that you want to follow to make a sunspace that is both an efficient heater and a pleasant place to spend time. 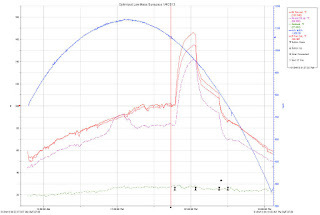 - Some careful tests done on my sunspace to measure the actual heat output and efficiency for an optimized sunspace and compares it to high quality active solar collectors. 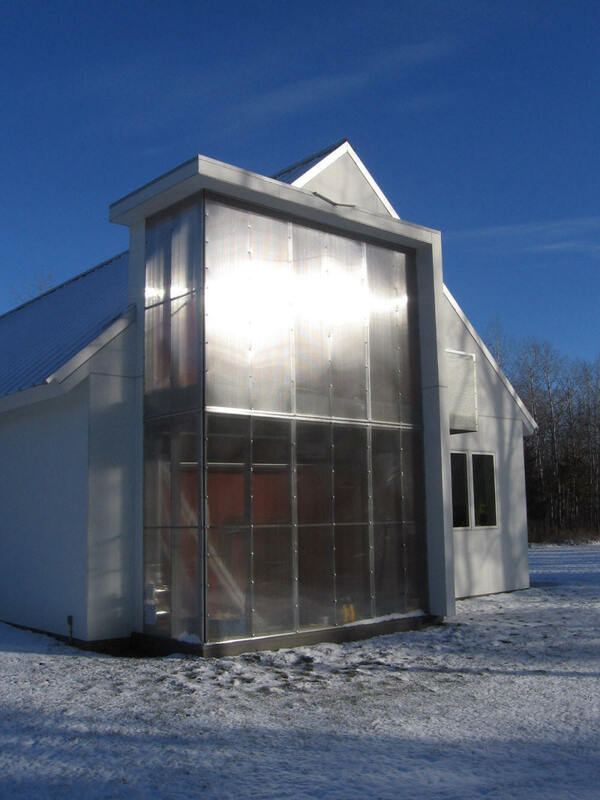 The bottom line is that a well designed low thermal mass sunspace is just as efficient as a space heater as high quality active solar collectors -- and you can enjoy a nice morning cup of coffee in the sun sitting inside your collector! 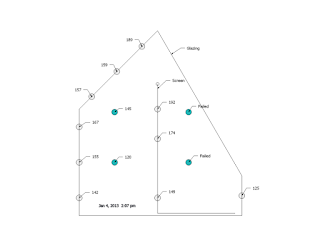 Another result that emerges from this testing is that there are several design rules that need to be followed if the sunspace is to be an efficient producer of heat. 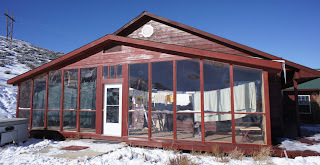 This is Mike's retrofitted low thermal mass sunspace in the Colorado mountains. It is an efficient space heater for the house, but also provides a wide range of other uses including lounging in the sun, kids play area, and a clothes drying area that saves an additional 1200 KWH a year in itself -- just this side benefit is equivalent to the yearly output of a 1000 watt PV array. And, it looks great. This is Nick Pine's new cutting edge three story low thermal mass sunspace. 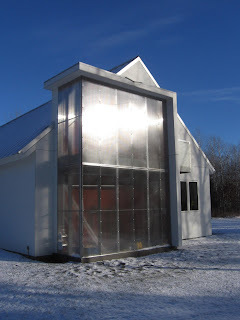 Nick has tried a number of innovations in this sunspace including DIY clear polycarbonate glazing, a unique air distribution system, and a mesh scheme that promises even more efficient operation. This is Architect William Sikora's modern and elegant low thermal mass sunspace in Minnesota. The sunspace not only looks great, but it is designed to be very simple in operation and maintainable by the home owner using only ordinary tools. There are other examples that show how very low budget versions of the sunspaces can be built that are still effective heaters, and an example of a 100% solar heated home that uses a low thermal mass sunspace as the only heat source. I want to particularly thank Mike P., Nick Pine, and William Sikora for taking the time to document their sunspaces. For all you low thermal mass sunspace owners out there, I hope you will use the comments section (or email me) to pass on your experiences with your sunspaces. Great work Gary. I have been building sun spaces off and on since the mid 70's and cannot imagine not having one. 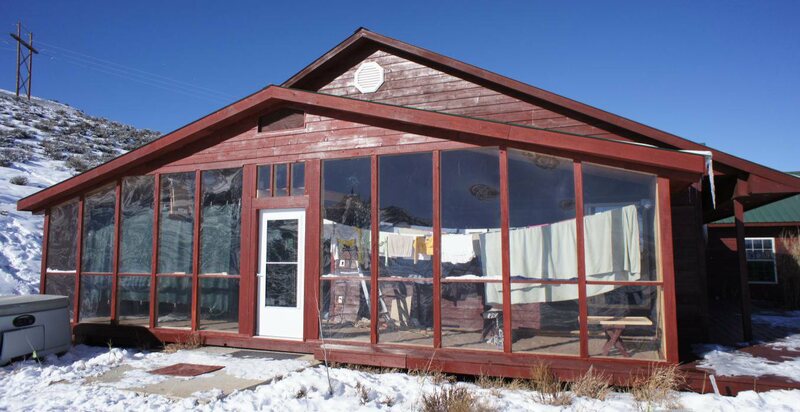 Since we live in northern New Mexico where adobe is common I am into using thermal mass to soak up the heat during the day and release it into the living space at night via a shared mass wall between the sun space and the living space. In that scenario it is important to keep the sun space narrow (say 4' to 6' wide) so that the sun reaches the shared wall. In designing a sun space it is good to consider design objectives such as whether you want heat or a breakfast nook or a larger space for other activities. There are trade offs to be made. Also in our use it is critical to be able to close off the sun space at night to keep heat loss from the windows from cooling off the living space. We try to grow only cactus, geraniums, succulents, etc. that can take low humidities as warm excess humidity migrates to the living space condensing in the cooler air creating mold problems. Humid loving plants also tend to introduce aphids, mealy bugs, etc. The plants help clean the air and produce oxygen. This winter when we had outside daytime temps below freezing for a couple of weeks our sun space was like a trip to the beach. The wall between the sun space and living space is a great place to locate plumbing as the pipes will never freeze and if your shower shares that wall it will dry much faster after use reducing mold. Looking out from your kitchen sink window to the sun space is a great view in the winter. I recommend no roof glazing as it over heats in the summer and loses heat in the winter.